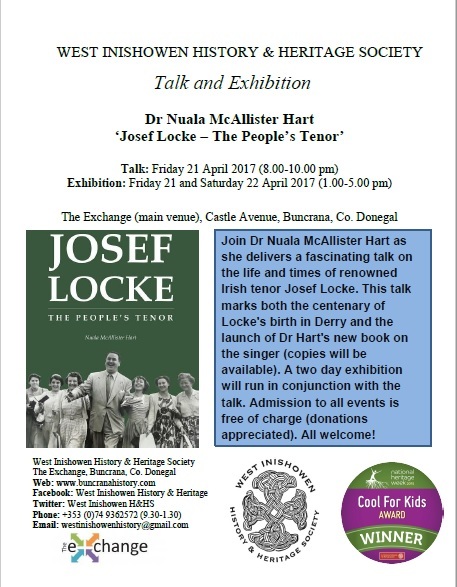 Join Dr Nuala McAllister Hart as she delivers a fascinating talk on the life and times of renowned Irish tenor Josef Locke. This talk marks both the centenary of Locke’s birth in Derry and the launch of Dr Hart’s new book on the singer (copies will be available). A two day exhibition will run in conjunction with the talk. Admission to all events is free of charge (donations appreciated). Refreshments will be available. All welcome! For more information please see our Facebook event page. Printable poster available here Josef Locke April 2017 Poster Talk.